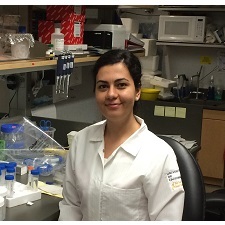 Dr. Aksoy is establishing a human stem-cell based model of medulloblastoma brain tumors that can be rapidly manipulated, allowing insights into how genetic mutation contributes to medulloblastoma tumorigenesis and how these mutations cooperate in tumor formation. She will study the highest-risk subtype of medulloblastoma, with the goal of understanding the possible role of translational control in this cancer. She will test both novel and existing mTOR inhibitors as a potential therapeutic strategy for patients. Project title: "Understanding the role of translational control in humanized mouse models for medulloblastoma"
Leptomeningeal metastasis, or spread of cancer cells into the spinal fluid, is a devastating complication of cancer resulting in rapid neurologic disability and death. With little mechanistic information to guide treatment decisions, efforts at treatment are too often futile. To address this critical knowledge gap, Adrienne will employ a translational approach to analyze patient samples utilizing multiple, complementary, orthogonal molecular strategies as tools for discovery. This approach will be coupled with hypothesis-driven mouse models to assemble coherent molecular mechanisms that describe cancer cell interactions with their microenvironment. This mechanistic work will suggest new targets for therapeutic intervention, paving the way for novel treatment approaches. Dr. Boire works under the mentorship of Joan Massagué, PhD, at Memorial Sloan Kettering Cancer Center, New York, New York. Project title: "Molecular determinants of leptomeningeal metastasis: a translational approach"
Brain metastases are the most common tumor in the brain, most frequently originating from melanoma and carcinomas of the lung and breast. Of patients who develop brain metastases, approximately half succumb to the cancer in their brain. Unfortunately, treatment options are limited, and most current clinical trials in the US exclude patients with brain metastases. Dr. Brastianos recently completed a large study to understand the genetic changes that occur in brain metastases. She identified genetic alterations in brain metastases that predict sensitivity to targeted therapies. She will conduct a biomarker-driven Phase 2 study to evaluate targeted therapy in patients with brain metastases harboring specific genetic alterations. Her research will incorporate cutting-edge genomic technology and animal models to understand predictors of response, as well as resistance to targeted therapies. As most genomically guided trials in cancer have excluded patients with active brain metastases, this represents a potential paradigm shift in the management of patients with brain metastases. Project title: "Investigation of novel targeted therapeutic approaches for brain metastases"
Dr. Chang is investigating the role of activity-regulated gene expression in human brain evolution. Activity-regulated pathways control critical brain functions and modulate tumor growth in multiple cancers. These pathways are broadly conserved across all mammals, but newer studies have identified features that are unique to primates and may influence important aspects of brain function and tumor progression. Dr. Chang will study the function, regulation, and evolution of primate-specific genes. Through these experiments, she aims to uncover molecular insight into what makes humans susceptible to cancer. Project title: "The role of activity-regulated gene expression in human brain evolution"
Glioblastoma remains the most aggressive brain tumor diagnosed in patients, and it is clear that new treatment strategies are needed. There is significant optimism around the use of approaches that stimulate a patient's immune system to treat brain tumors. Gavin focuses on identifying the specific components of a patient's brain tumor that the immune system recognizes and determining whether there are regional differences in this immune recognition. He hopes that this work will increase our understanding of how the immune system recognizes brain cancers and will increase our understanding of how to rationally design personalized vaccines to treat these tumors. Project title: "Characterizing the immunogenic landscape of glioblastoma"
Dr. Maus is engineering the body's own immune T cells to fight deadly brain tumors like glioblastoma. However, in studies of patients with brain tumors, she has found that tumor cells can escape the engineered T cells. She is now redesigning T cells so that they block escape routes used by the tumors. 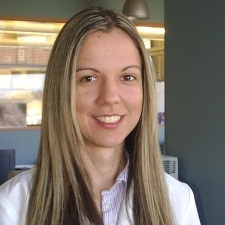 She expects that the engineered cells will be more powerful and may become a new effective treatment for brain tumors. The engineered CAR T cells are designed to target cells displaying multiple abnormal proteins (antigens) made from cancer-causing oncogenes; theywill act as drug carriers to address the specific hurdles of antigen heterogeneity and penetrating the blood brain barrier. 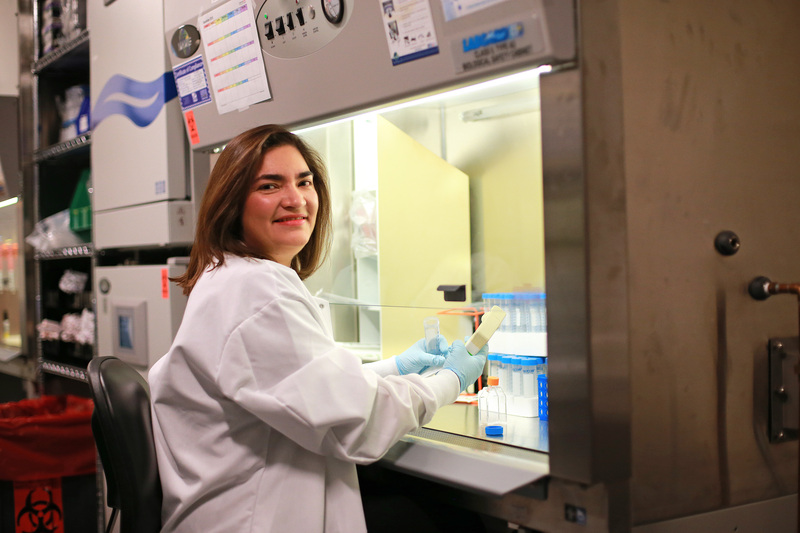 She is testing these "living drugs" in vitro and in mouse models with the goal of ultimately advancing these studies to human clinical trials. Furthermore, if this system works for brain tumors, it has the potential to be applied as a therapy for other forms of cancer as well. 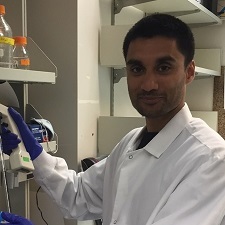 Project title: "Next-generation CAR T cells for EGFRvIII-positive glioblastoma"
Dr. O'Brown is investigating the molecular mechanisms that govern the blood-brain barrier (BBB), which acts as the gatekeeper for the brain. While the BBB protects the brain from pathogens and provides the necessary environment for normal brain function, the BBB also acts as an obstacle to drug delivery for the treatment of neurological diseases, including brain tumors. A key regulator of BBB integrity, Mfsd2a, limits transcellular movement across the barrier and therefore prevents leakage into the brain. Using a combination of zebrafish genetics, small molecule screens, and live imaging, she aims to understand how this protein regulates these BBB processes. 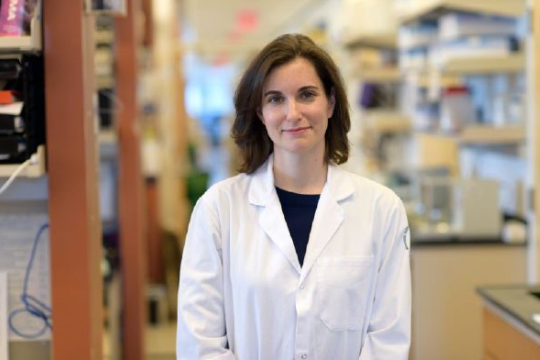 By investigating the cellular signals that induce or remove barrier properties, she hopes to identify ways by which she can selectively manipulate the barrier to allow for drug delivery to the brain. 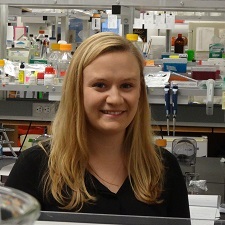 Project title: "Molecular and cellular mechanisms of transcytosis regulation in blood-brain barrier function"
Dr. Pfau aims to identify the molecular regulators of blood-brain barrier heterogeneity. The blood-brain barrier (BBB) protects the brain from harmful substances to ensure proper brain function. Consequently, the BBB renders many cancer therapeutics ineffective for treatment of primary and metastatic brain tumors, as drugs that effectively treat cancer in the rest of the body cannot efficiently enter the brain. She seeks to better understand how the BBB functions by characterizing the “windows of the brain,” regions where the barrier is naturally more open to allow communication between the brain and the rest of the body through the bloodstream. In determining how the BBB is altered in these regions, she anticipates that her work will identify key molecular regulators that the brain naturally uses to open the blood-brain barrier and thus provide insight into how it can be modulated to promote drug delivery to tumors in the brain. Project title: "Investigating the molecular determinants of blood-brain barrier heterogeneity"
Dr. Sarthy is developing new easy-to-use and affordable methods for studying DNA packaging and epigenetics (modification of gene expression) in pediatric cancers with a special focus on diffuse midline gliomas and neuroblastoma. These methods may help explain the drivers of pediatric malignancies and allow clinicians to better monitor response to treatment with the goal of developing new drugs that restore the cell’s ability to package DNA correctly. 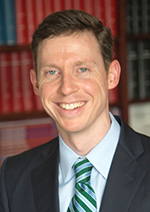 Dr. Taylor is investigating the impact of neural activity on pediatric high-grade glioma (pHGG) invasion. The innate ability of pHGGs to diffusely infiltrate healthy brain tissue is a classical hallmark of the disease, which represents a major contributor to the devastating prognosis. Using optogenetic techniques to stimulate neuronal activity, she will directly and noninvasively test the effect of activity-dependent secreted proteins on tumor cell invasion in human cancer cells and animal models. 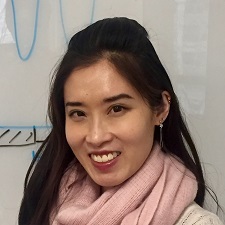 She plans to confirm the pro-infiltrative effect of candidate proteins on pHGG and subsequently uncover the mechanisms by which they alter the molecular dynamics of the tumor cell. Her hope is to highlight a novel means by which the neural microenvironment drives glioma progression and most importantly identify a new set of therapeutic targets to limit glioma spread. Project title: "The effect of neuronal activity on pediatric glioma invasion"